On this edition of No Holds Barred, host Eddie Goldman discusses the upcoming Carl Frampton-Scott Quigg and Guillermo Rigondeaux-Jazza Dickens super bantamweight fights, and gets comments from the fighters. The long-awaited title unification fight between the two unbeaten fighters, IBF champion Carl Frampton and WBA champion Scott Quigg, will take place Saturday, February 27, in the Manchester Arena in Manchester, England. It will be televised live in the U.K. on Sky Sports Box Office and live in the U.S. on Showtime Extreme. Frampton (21-0, 14 KOs), of Belfast, Northern Ireland, is known more as a boxer. Quigg (32-0-2, 23 KOs), of Bury, Lancashire, United Kingdom, is seen more as a puncher. On Saturday, March 12, one of the best pound-for-pound fighters and technicians in the world, and also one of the most avoided fighters in the world, two-time Olympic gold medalist Guillermo Rigondeaux (16-0, 10 KOs) returns to action. He will face a huge underdog, the 24-year-old British super bantamweight champion James "Jazza" Dickens (21-1, 6 KOs). This fight, on the undercard of the Terry Flanagan-Derry Mathews WBO lightweight title fight, takes place at the Echo Arena in Liverpool, England. It will be shown live in the U.K. on BoxNation. Thus far, no U.S. telecast has been announced. 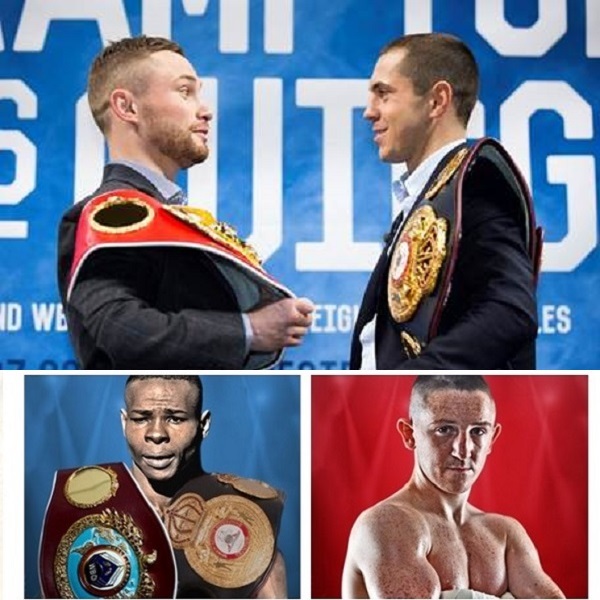 We spoke with Carl Frampton, Scott Quigg, Guillermo Rigondeaux, and Jazza Dickens on recent media conference calls to get their views on their fights and their plans. The North American Catch Wrestling Association, a grassroots organization designed to help rebuild the sport of catch-as-catch-can-wrestling. For more information, go to their Facebook page at facebook.com/NorthAmericanCatchWrestlingAssociation. BJJ Eastern Europe, for the latest Brazilian Jiu-Jitsu news, articles, interviews, competition calendar, European belt rankings, academy directory, and more. For more information, go to BJJEE.com. The National Registry for Wrestling, whose mission is to increase wrestling's fanbase, to build a registry of all wrestling fans, to serve as a connecting point for all wrestling fans, and to provide TV and Internet listings for wrestling. For more information, go to NR4W.com.